In the United States, almost 6 million homes have been/are projected to be sold in the year 2018. That massive number dwarfs sales figures we've seen over the last half-decade. All of that to say that homes are getting bought up at a break-neck pace! But is buying a home really the same as owning it? Whether you're the proud owner of a new home or have even been on your property for a few years now, really taking the time to plus out its design will not only improve its value and comfort but can make it so its style sensibilities align with who you and your family are. To help you start owning your home's design, our team has compiled this list of 6 interior design trends that are going to be big in 2019! The population in the United States is already at 328 million people and shows no signs of slowing down. That means, especially if you're in a big city, spaces are getting tighter and being ingenious with your interior design approach is becoming essential. That's why among our interior design trends for 2019 are convertible dwellings. We're talking modern Murphy beds, moveable walls/space dividers, and a slew of built-in fixtures. We love convertible dwellings not only for how much care they have for every square foot of a household but because every creative solution they provide is an excellent conversation starter. Bottom Line - If you're feeling tight on space in your home, do not view that reality as a drawback. Look at it as an excuse to incorporate today's latest and most creative interior design trends into your living space! We've all heard of accent walls. Maybe a handful of you out there have even tried your hand at stenciling lines or zigzag patterns onto one of your walls and painting them to add a pop of texture to your space. In 2019's interior design trends however, we're leaving the accent wall behind for a moment to instead focus on accent ceilings! Accent ceilings or "Statement Ceilings" are similar to accent walls in that there are no rules with them beyond creating contrast against your surrounding space. Accent ceilings can sport patterns, solid colors and can be painted or wallpapered. Start getting those wheels turning in your head as to where one might best incorporate into your home! 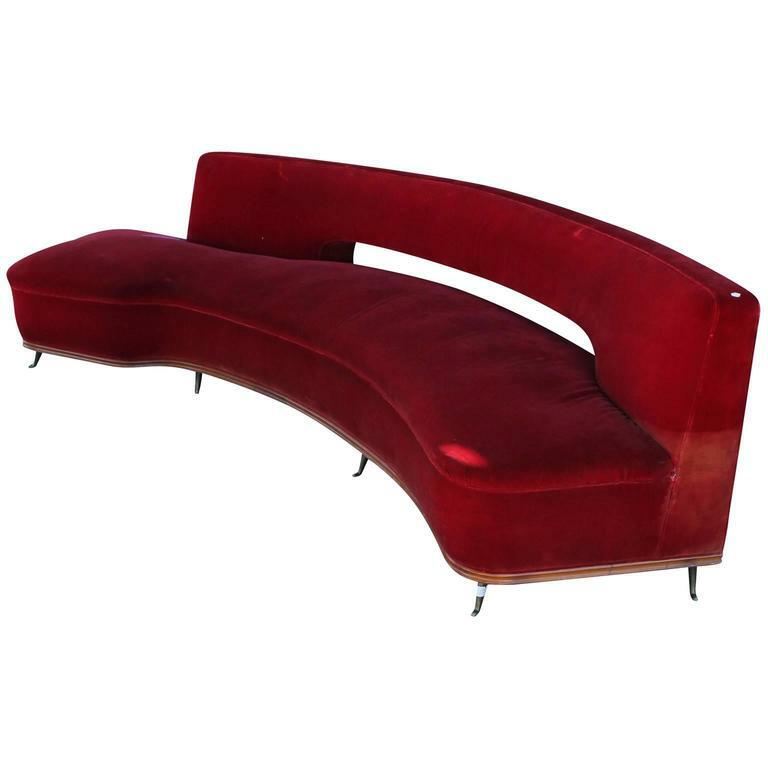 Many of us remember the eye-catching, red, curved, velveteen sofas of the 1960's. Shortly into the 70's though, they and other curved furniture pieces faded into obscurity. Well, as with all old trends, what's old is new again. And in 2019, that will hold true for curves in furniture. Look to see bright, curved sofas acting as accent pieces in otherwise masculine looking rooms. Also, keep an eye out for curved coffee tables separating sofas, circular stools at the foot of accent chairs and round rugs breaking up spaces with wood or concrete flooring. 2019 is going to be a year of bringing life into rooms. Minimalism is far from gone but the cold, sometimes staleness that it comes with is going to start to give way to more people looking to add motion to their spaces. That motion is going to come in the way of liberal usage of geometric shapes and tribal patterns. Look to add tribal patterns and shapes to your room's wallpaper, to the upholstery on your sofas and liberally in accent pillows. If you have exposed beam ceilings, we love the idea of adorning your beams with some tribal and shape inspiration. Watch out for your space becoming too busy with this trend but also feel empowered to experiment with adding more liveliness to your interior design than you'd normally be accustomed to. Making a home eco-friendly is not among the newest of interior design trends by any stretch but it's also not a trend that's slowing down. As consumers become more conscious of the environment and find themselves progressively exposed to a concrete jungle outside, they're going to look to add more plants and recycled materials to their spaces. Think along the lines of live plant walls, the recomposition of leftover marble, energy efficient appliances, and big windows for a lot of natural light exposure. This interior design trend not only looks fabulous when executed well, but it also comes with the added benefit of saving you money! Bare walls had been on the rise as people found themselves progressively swept away into minimalism and modernism. Now the tide is coming back just slightly and wall art is going to start becoming a commodity with people looking to tie their space's palette together or add culture to their home. When it comes to incorporating wall art into your space, we recommend paying extra attention to color and ensuring that the piece's use of it works to blatantly contrast its environment or marry it. Anything in between those two outcomes may feel uninspired. There's no better way for you to own your new or existing home than by embracing the art that is interior design. While interior design trends are a notoriously hard moving target to stay locked in on, our group is confident that armed with the information above, you can move forward planning your home's next big design awakening knowing that your additions will be relevant in the new year! For help redefining your living space with today's and tomorrow's hottest interior design trends, look no further than The Maya Company. Our team of design experts specializes in providing our customers with pieces that suit their sensibilities and make houses homes. Check out our newest collection today or for help with your interior design journey, contact one of our team members!